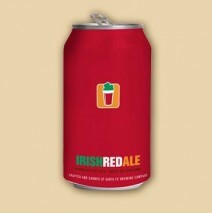 Just in time for spring, this Irish Red Ale will bring out the malt-lover in all of us. Using a subtle blend of American and Noble hops, this beer is a harmonious anthem to malty goodness. Brewed with the highest quality heritage barley and succulent golden oats, this Maris Otter based brew, bursts with smooth caramel and chocolaty notes with a clear garnet hue. Its delicate sweetness compliments the full-body flavor of this session brew trailed by perhaps this beer’s most intriguing characteristic—its dry finish. To the beer-lover who appreciates a true session beer, this Irish Red offers an excellent balance of malt’s two signature attributes—sweetness and roasty dryness. Slainte!